Nature’s bounty is always extra generous in the fall. 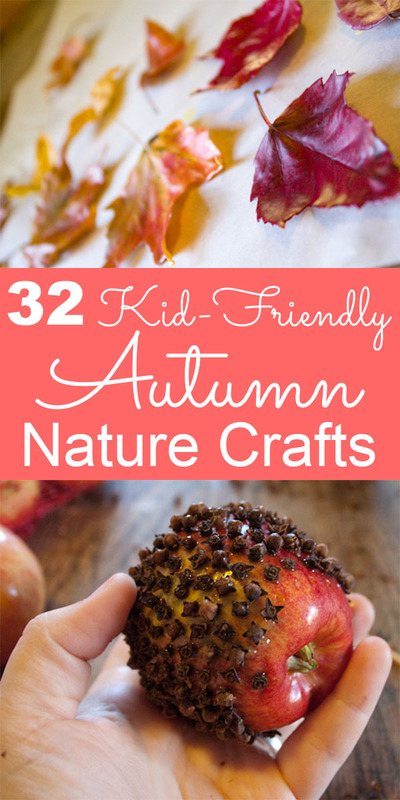 Make the most of it with these kid-friendly nature crafts for autumn! 1. acorn bells. An alternative to using whole acorns in your craft projects is to use just the acorn caps. Bells make a sweet substitute! 2. acorn marbles. This is another cute substitute for an acorn. 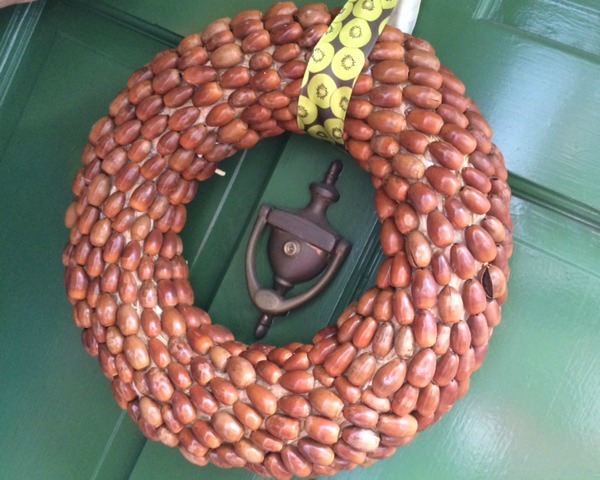 3. acorn wreath. This takes some time to pull together, but when you’re finished, you’ll have a fabulous showpiece for your front door. 4. apple prints. These look especially pretty done on linen and made into a bunting. 5. autumn art. My favorite part is the twig picture frame. 6. autumn woods sensory bin. Little kids will love exploring this small world. 7. paper punched leaves. These would look amazing in your autumn nature journal or scrapbook. 8. bleached pinecones. I don’t love bleach, but if you’ve got it, this is an interesting way to use it. 9. clove apple. 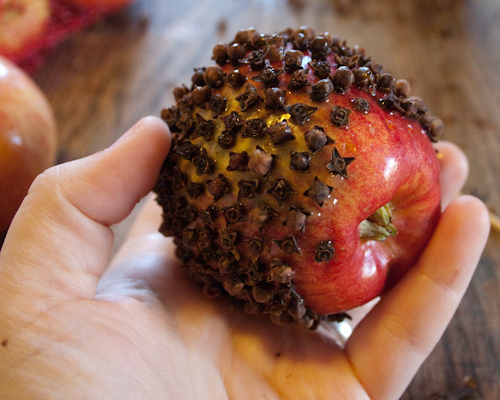 Ma Ingalls made her clove apples just like this. 10. decoupaged leaf bowl. People will wonder how you made this! 11. dehydrated orange garland. You can do this with several different types of fruit. 12. glycerin leaves. Here’s another way to preserve autumn leaves. 13. happy acorn necklaces. You know what acorns need to be even cuter? FACES!!! 14. leaf hair. Here’s a fun craft for your little ones–just substitute faces cut out of upcycled cardboard for the foam faces called for in the tutorial. 15. leaf insects. Here’s another fun craft for kids to make! 16. leaf mobile. The tutorial calls for the use of a laminator, but you can substitute your favorite natural method of preserving leaves. 17. leaf prints. A bunting made of alternating leaf and apple prints would be really cute. 18. leaf wreath. Use a circle cut from upcycled cardboard instead of the paper plate that this tutorial calls for. 19. nature walk mobile. See how many natural finds you can use in this mobile! 20. painting on leaves. If you live somewhere where the leaves don’t turn, here’s how to help them out a little. 21. beeswax-preserved leaves. 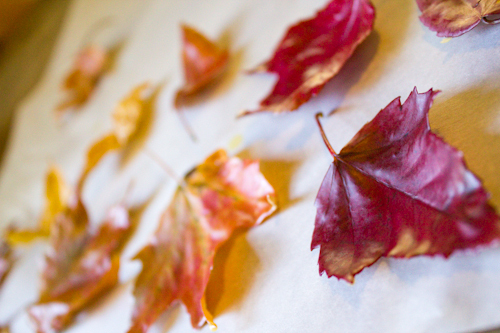 Here’s a natural way to preserve your most beautiful autumn leaves. 22. pasta shell tree. Here’s an autumn craft that will let little ones play with their food! 23. pinecone apple. Kids love turning things into other things. 24. pinecone fairy. You can make this magical fairy entirely from natural materials! 25. pinecone flowers. Make something really different with those pinecones. 26. pinecone owl. Love owls? This craft is for you! 27. potato stamping. Did you know that you can make a potato look like a leaf? You can! 28. reverse-stenciled leaves. You can use this method on almost any surface. 29. salt dough leaf bowl. This is a great kid craft, but it can also look very sophisticated when made with care. 30. salt dough leaf prints. Here’s what to make with the salt dough leftovers. 31. watercolor paper leaf and branch mobile. The branch is natural, but the watercolor paper leaves are what make this project unusual. 32. wrapped wheat. Add some color to wheat stalks for a great centerpiece.